bioenergy technologies as part of the expansion of renewable fuels, energy and bioproducts. The conference programme has in part been based on the successful format used for the European Biomass conference that takes places annually in Europe. The conference programme will cover a range of topics: Topic 1 – assessment and production of biomass resources; Topic 2 – systems and technologies for biomass power and heat; Topic 3 – processes and technologies for biogas and bio-natural gas (biomethane); Topic 4 – processes and systems for biofuels and biomaterials; Topic 5 – tools and initiatives for bioenergy. This means the conference necessarily involves close interactions between the pure science, innovation and industrial exploitation of the results of research, with the overall target of achieving economic and environmental sustainability in the developing low-carbon economy. There will be a focus on how scientific innovations can be efficiently exploited, what are the needs of the cutting edge industries leading the way with scaling up of technologies, in which ways different renewable sectors can integrate to provide optimum sustainable solutions for replacing fossil energy. The call for abstracts is open until 3rd February 2017. Please have a close look at the outline topics in the programme and see how you can best contribute to the closer interaction whether you are a researcher, an industry person or indeed a policy maker working with biomass. We look forward to assembling an exciting and rewarding programme for Shanghai in April 2017. 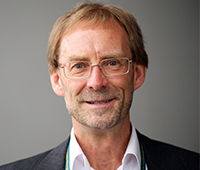 Dr. David Baxter has been a member of the Sustainable Transport Unit in the Institute for Energy & Transport of the Joint Research Centre (Petten, The Netherlands) until retirement from the European Commission in August 2016. He was part of a team providing scientific and technical support to the development and maintenance of sustainability schemes for biomass and bioenergy, including biofuels. In addition, he was a member of the European Bioenergy Industrial Initiative (EIBI) team which is operates within the frame of the Strategic Energy Technologies (SET) Plan. He is also a former leader of the International Energy Agency Bioenergy Biogas Task 37, promoting economically and environmentally sustainable management of biogas production and utilisation from agricultural residues, energy crops and municipal wastes. David Baxter is a materials engineer who joined the European Commission Joint Research Centre in 1991 after working in an industrial company supplying components for power generation and transport. He also spent 5 years at Argonne National Laboratory in the USA in the 1980s carrying out research into materials for fossil energy technologies.